Sister Wendy Beckett, the cloistered nun who went out of seclusion to become a celebrity television art critic and historian, died Wednesday at England’s Carmelite Monastery Quidenham in Norfolk, according to the BBC. She was 88 years old. She graduated from Oxford University as an honor student in literature in 1954 but taught herself the history of art from the hermit's trailer where she lived on the grounds of a Carmelite monastery in Norfolk, England. At an art exhibit in Norfolk, where a BBC camera crew happened to be taping a documentary about feminist author Germaine Greer, Beckett was asked to give her impression of the show on tape. It launched her television career. She cut an unconventional figure for a television personality with her black nun's habit and oversized eyeglasses. 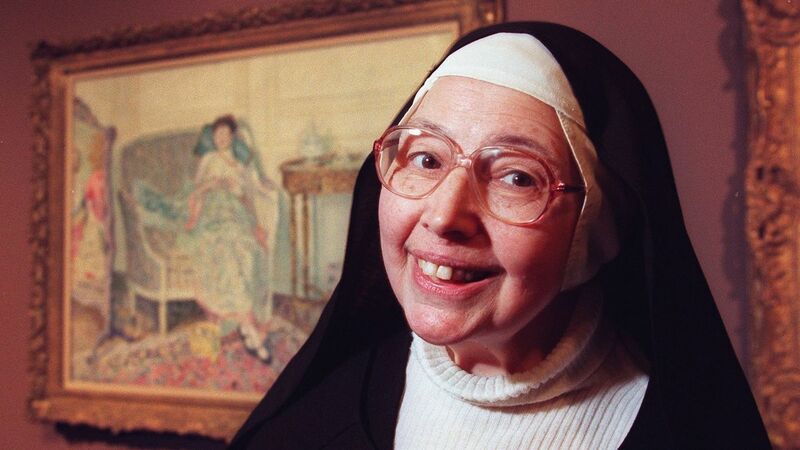 From the airing of her first series, “Sister Wendy's Odyssey,” in 1992, she evaluated artworks. Her unique style drew close to 4 million viewers. She was born Wendy Beckett, in East London, South Africa, one of two children. Her father was a bank clerk who later changed careers to be a doctor. “From the time I was age 2, my family knew that I would be a nun,” she once said. At Oxford University, as a student in her early 20s, Beckett lived in a nun's hostel and soon after graduation moved back to South Africa to teach in a religious school. But persistent heart trouble and a history of epilepsy drained her strength. Health problems combined with the dream of a contemplative life, which she had abandoned when she entered her order of teaching nuns, led Beckett back to England. In the early 1970s, she was released from her vows as a Sister of Notre Dame and changed her religious status to “consecrated virgin,” with the blessing of the Vatican. From then on, she was not a member of any religious order but continued to wear a homemade black habit, a variation on the one she wore as a Sister of Notre Dame. Asked once to explain her choice, she said, “I am a nun. I will always be a nun.” She had spent more than 20 years in a convent, perfecting the ways of religious life. As a hermit, she did not feel the need to belong to any particular order. The Carmelites offered her a home on their property and took care of her for the rest of her life. They delivered her meals to the unheated trailer where she slept on the floor. She in turn contributed most of her income to the convent. By 2002, Beckett had published some 20 books and completed 11 art programs for public television. Royalties and residuals amounted to an income large enough for her to replace her trailer-hermitage for a newer model, with heat, and to put aside some money for her retirement, as well as help pay the convent's expenses. One of her last programs was “Sister Wendy at the Norton Simon Museum,” which aired in October 2002. Beckett is survived by her sister, Barbara.